by Rev. W. H. Davis, B.A. A missionary faces great difficulties when he sets out to translate the Bible into another language. How will be express thoughts, or describe things that are strange and unknown to his people? How, too, will he make sufficient copies for everyone? 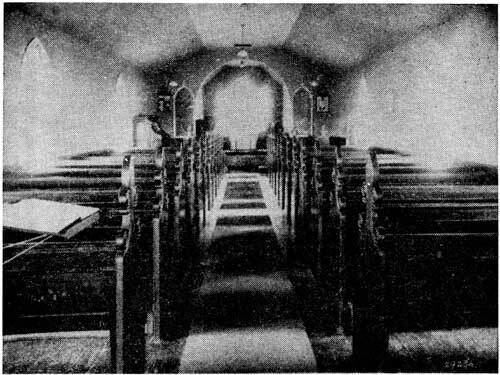 Interior of Christ Church, Anglican, The Pas, Manitoba. These very fine large fleur-de-lis shaped aisle boards were carved by men who tried to rescue Sir John Franklin. Spending a winter here a hundred years ago they spent the time hand-hewing and carving the pews in this church. The Ten Commandments in Cree are in the window recesses alongside the pulpit. It is also of interest to see how copies of Cree Scriptures were first printed for these people. James Evans, the first missionary to reduce Cree to writing, took sheets of birchbark for paper. He made his type from the lead lining of tea chests. His type moulds were made from mud. His letter forms for the moulds, he carved with a jack-knife out of wood. Ink was made from soot and grease. A fur-baling press was his press with which he made his slow and smudgy pages. The loose pages were sewn together by hand, and soft deer skin made the covers of those first Bibles made in the forest. This was at Rossville, Norway House over 100 years ago. A Cree Dictionary can be bought for $2.50 from the Anglican Church Missionary Society, 600 Jarvis St., Toronto 5. Bishop Hives' Cree grammar which contains fairly extensive vocabularies is also obtainable from the above address at the same price.